The plan for an industrial dairy has been defeated. 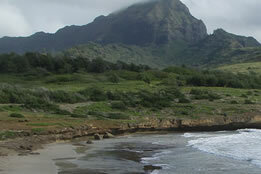 The need continues, however, for FOM to work to protect Kauai’s water quality. Episode of Eyes on Hawaii with guests Genard Frazier from O`okala on the Big Island, and Bridget Hammerquist from Koloa, Kauai. They review and discuss the concerns members of the O’ okala community have raised regarding the “significant” impact the Big Island Dairy has had on the community from untreated waste runoff. A planned dairy farm in Hawaii has taken a step back by withdrawing parts of its application to allow more time for discussion of its likely environmental impact. Both sides of Kauai dairy farm debate fight for public support. The Environmental Protection Agency is calling on the state to post warning signs at Kauai’s Mahaulepu Beach, just upshore from the Garden Isle’s gold coast. Kauai County & Hawai`i State candidates for office answer a myriad of questions about several pertinent issues in their districts. The Friends of Maha`ulepu have a deep concern for Maha`ulepu and the surrounding area. Hawaii Dairy Farms proposal to do a concentrated feed lot on 500+ acres will produce a myriad of detrimental effects on the area. Toxic runoff, biting flies, odors, increased use of the roads are some of the dangers. Listen to Friends of Maha’ulepu’s recent radio spots combined with beautiful footage created by one of our members! Friends of Maha‘ulepu put up signs, warning beachgoers of contaminated water. Listen to Paul Cienfuegos, nationally renowned ‘Community Rights’ educator and organizer, who has successfully helped communities from California to Iowa. He shares information on what we can do now to protect our precious Kaua‘i from harmful industrial operations. Carl Berg, co-ordinator of Kauai Surfrider’s Blue Water Task Force summarizes 2015 water test results for bacterial and chemical pollution. This four part series documents Friends of Maha’ulepu voicing their concerns in respect to how a proposed 2000 cow industrial dairy will negatively impact their shoreline, marine water, groundwater, and drinking water. The beach and its flora and fauna will be threatened by the potential for an industrial dairy that would be situated just upslope from the beach. Part 4 of the series concerns Scott Enright’s response pertaining to the Risk to Public Health the dairy presents.